Novelist Juan José Saer (1937-2005), a major figure in late 20th century Argentine literature, elaborated a highly personal style over the course of many books, grounded in his native province of Santa Fe. His work features a revolving cast of characters, locales, and points in history that lend the region a sort of mythological depth, while remaining ever open to the wider world. 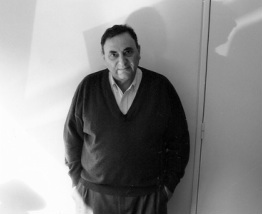 He published his first books in the 1960s before going off to Paris in 1968, where he ended up staying for the rest of his life, commuting to the university in Rennes to teach literature. To date, six of his novels have been translated into English, most recently Glosa (1988; The Sixty-Five Years of Washington, 2010) and Cicatrices (1969; Scars, 2011). The following interview took place at his home right near the Montparnasse train station in Paris, on July 2, 1997. How did the mythical aspect of your native city, Santa Fe, enter into your books? It entered for a very simple reason. When I was young, I had never left Santa Fe. I think I was 19 when I first visited Buenos Aires, and then I didn’t go back until I was 26. So that, I was always around there—Rosario, Santa Fe. But at the same time, I read a lot. So, all my representations of the world—from Athens in the classics through Chandler’s Los Angeles and Faulkner’s Yoknapatawpha—all those were my own experiences of Santa Fe. Certain houses in the novels reminded me of houses in Santa Fe. In that way, all those cities kept acquiring a sort of density. By then I had gone a lot to Buenos Aires, but I had never left Argentina. And always that circuit—Rosario, Santa Fe, Paraná—and with people who had a strong interest in culture, debate, polemics, reading, the classics, the moderns, in reading other languages. All that is my formation. So, it seemed to me that one could adopt a metonymic attitude as narrator, something that’s been going on for a long time. Let’s not forget that The Iliad all takes place there in a limited space. We can say the same of the Quixote. So it wasn’t because of going off to Europe. No. Already before I went, a great portion of the books takes place there, the characters were already set, I wrote them in the years before I left. Even Cicatrices, and half of El limonero real, I had written there. They came out a little later because I had some problems finding a publisher, as happens at first with every writer. Also, another thing that was important for me was the spoken language. So, the interest in writing for me is being able to write on universal themes in my native tongue with an oral intonation. If not, it’s not interesting. The adventure of writing in a literary, codified language, and all that, doesn’t interest me. Do you feel that the mythical aspect in your books has changed? Yes, I think it’s changed a little. I’d like to be able to capture that new thing, but neither is my objective to write a chronicle of Santa Fe. Rather, it is to establish a certain type of relationship with the world through literature. I always say that the matter of Santa Fe is completely secondary, it could take place as much in Santa Fe as in Indochina. The fact of being far from your origins, has the distance clarified things there for you? Yes, especially in the years of the military dictatorship, which necessarily obliged me to think about the social and historical reality of that country, which has always interested me, of course. I think the distance opened up new perspectives for me, not just for judging my own country. But it came naturally. One day I realized that I was seeing everything as a whole, that I had left a little and I was seeing as if from above. And that helped me understand many things. Also, the comparative experience of two different societies, that always helps. At the same time, it put in context certain values of European culture, or of the rich and selfish countries. I have a more practical and immediate view, more empirical, of what European culture is. I no longer mythify it so much, only what should be mythified, those things that deserve it. To take up some biographical details, were you born in a small town? In a small town, Serodino, in the province of Santa Fe. Until I was eleven, I lived in a small town on the pampas. Then, we moved to Santa Fe, I did part of my schooling there, then I was in Rosario for a time, then I got married in ‘62 and I lived for six years in the country again, but not near the pampas, rather by the coast of the Paraná River, near Santa Fe. So, those two environments dominate as the background in practically all I’ve written. After, I came to Paris in ‘68. You never lived in Buenos Aires? I didn’t live in Buenos Aires, but in the 1960s I went often to Buenos Aires and I stayed for long stretches because I was working as a screenwriter. For two or three years, I traveled a lot to Buenos Aires, I stayed a month, two months at a time. Why didn’t you continue on that path? I think Argentine cinema is always in crisis, it was something I did to earn money. But I have always preferred having economic independence to be able to write what I wanted. I never wanted to have to earn my living with literature. And where did this desire come from, the need to write? I always had it. Practically since I learned to read and write, I was writing. I never wanted to be anything else. Yes, at a certain moment it occurred to me that maybe I could make films. But no, one had to get up early, and what’s more, film gets old very quickly. One reads Ulysses, it seems it could have been written yesterday. To see a film that was made ten or eleven years ago, you almost can’t see it anymore, the styles change. Was there much influence at home, in your family? In my family, no. Well, of course my parents wanted their children to go to school, to get degrees and everything. That’s one of the reasons why we moved to Santa Fe, so that the children could study. My brother is an engineer . . . My parents were poor immigrants. But my father was a man who aspired to culture. He had his way of being cultured, which was to not be a Peronist. He was very pro-Allies, anti-Nazi to death. He was a Roman Catholic, but he was a tolerant man. And I recall that already when were living in the small town still, he built us—he did it himself, with his own hands—a sort of desk, so that we could work and read there, and he made us bookshelves above. Such that at home there were no books, but there was the aspiration to that. And there were some books in Arabic around the house there. And were you hearing that? Yes, of course. My older brothers even spoke a little. My mother had come over to Argentina at a younger age, when she was three. She was the oldest sister, all her brothers and sisters were born in Argentina, except for her. But my father came when he was eighteen, nineteen years old. My father read a lot of Selections from the Reader’s Digest. For him, it was a form of gaining access to culture. For me, it’s pure poison, but all right, there was a desire. Did they both come from Syria? Yes, but they didn’t come together. They met there, and they got married in around 1925. How did French culture enter into your world there? First already, of course, I was reading a number of French writers whom I idolized—Flaubert and Proust, Balzac, the poets, Baudelaire. I had started to read French there, on my own. I had studied it a little in high school, like English. I remember when I was doing my military service, I was twenty, and I had an asthma attack, in the infirmary I was reading Sentimental Education by Flaubert and Light in August. The famous myth of Paris, did that have any effect on you? No, for me Paris was never a myth. Rather, the cities that were mythical for me were Athens, London, Rome. No, I was never Frenchified. Moreover, in all the writers I like, the Paris painted by Proust for example, there is no myth of Paris—there is the Faubourg Saint-Germain, the Champs-Elysées. Flaubert, the reference is Normandy. Some things marked me much more. London, certainly, because when I was little I read the Sherlock Holmes stories. And I must say, when I first arrived in Europe and I went to London, Spain, or Italy, I found many things from my childhood. For example, caramels, crackers—there were many English things in my father’s store, there was a whole series of English products which are what I happened to see in London. On the other hand, in France there was practically nothing, perhaps in Buenos Aires in the luxury shops. The only French vocabulary that entered into popular Argentine speech is the vocabulary of the brothels and of dressmaking. Do you have a sense of being someone different since you went away? What it comes down to is that here in Paris things happened to me that hadn’t happened to me there. For example, being a father, having children. Reaching a certain age. All that accumulated experience, whether it would have been the same there or not, it’s impossible for me to say. I think it would not have been the same, and what’s more, I think that maybe I was lucky coming to Paris. Not lucky for my literary career, that doesn’t count at all, but rather for my life. I think even that staying in Argentina would have been dangerous for me at a certain point. If I had been there, surely I would have gotten active politically. Even though I was also an activist back then, with the guerrilla movement and everything, and I recognized at that time the need to change the political situation in Latin America. But I accepted violence up to a certain point as a response to violence by the state. And I still believe that the violence of the state is much more reprehensible than that done by individuals. Already at the beginning of the ‘60s when the whole guerrilla movement began, I declined to use violence. I don’t accept violence, it cannot be used. Because violence is killing someone, striking him, and that is unacceptable. Since you’ve been here, have you gone back much to Argentina? Yes. I stopped going for many years, between 1971 and 1982. For eleven years I went only once and right during the military coup, with my wife, because we had already gone to Venezuela, to Colombia, and we had planned to go to Argentina. In the middle of that, the coup occurred. We were there for a month, it was a horrible experience, in ‘76. We didn’t return until the end of ‘82. And for fourteen years nothing of mine was published in Argentina. Later, when Alfonsín came in, yes, I always went. And you always go to Santa Fe? Santa Fe, Rosario, Buenos Aires. The last time I went, in ‘94, I was in Córdoba, something I hadn’t done since 1960. Do you still have friends there? Yes, of course. Not only do I have many of my old friends, but I have new friends in Argentina. For example, I talk on the phone a lot with Argentina, two or three times a week, we call each other often. My sister and I call each other three or four times a month. I’m up to date on everything that’s happening. And at any rate, nothing is happening. Regarding Paris, why did you come here? I came by chance. I wasn’t thinking about coming to Paris. I was thinking of leaving Argentina. But a painter friend of mine, a sculptor really, when André Breton died in ‘66, a few months later he was working on getting a grant. And the director of the Alliance Française there says, Why not do something on André Breton, let’s do an homage to Breton. So, my friend came to see me, since I was teaching at the Film Institute, he thought he should do an audiovisual or something like that. We did the audiovisual, it pleased the Frenchy as we called him, and he invited us to eat. He said, You have to apply for a grant, which was my friend’s intention. Okay, I said, he applies, me no . . . No, no, both of you apply, I’ll make a favorable report for you. We both applied—and they gave me the grant, not him. A grant for foreign students, from the Ministère des Affaires Etrangères. For six months I came. My ex-wife—my wife from Argentina, the mother of my son—came too, she got a grant the following year, she began to work with Roland Barthes. After, I began to work in Rennes, my son was born, the situation in Argentina began to fall apart, later I got divorced. But I couldn’t go back anymore having a son here, I didn’t want to abandon my son, on the contrary, I wanted to stay with him. And so, little by little . . .
You arrived just after May ‘68? Yes, we were following all those events there in Santa Fe, in the bar of the Film Institute, on television. And after, I arrived here and everything had happened already, but all the froth remained. The following year, I entered the university of Rennes, and I saw how the spirit of May ‘68 was falling apart. What have your friendships with the literary world been like, whether French or Latin American? The truth is, if we’re all writers, I get very bored. Except for some with whom I have other things in common and we can talk about a thousand things that have nothing to do with literature. And later, I noticed for the first time here in Paris something that profoundly bothered me. When I got to know certain Latin American writers, each time we met, instead of talking about literature, they would talk about publishers, contracts, royalties. Frankly, that doesn’t interest me. I don’t find it praiseworthy that a writer sells a million copies, that doesn’t impress me at all. It doesn’t mean anything. But I don’t have much of a literary life. On the other hand, I like conversation a lot, debating, discussion, especially other subjects, whether scientific or philosophical. Do you feel nostalgic for things there? Yes, sometimes I do, each time less. Now I feel less nostalgia, but it’s a great pleasure when I arrive. You could say that after a while I begin to grow a little tired, I want to go back home. It happens like that with everyone. Wherever one travels, one wants to go back home. My home is this one. Has music counted in your writing? A lot. For me, the music is more important when I write than the meaning. If the phrase doesn’t have the music I want, I turn it around until it does. And music itself? Do you listen to it while you write? No. When I was younger, I could do many things at the same time. Now, for the last twenty years, no. But nor am I someone who . . . I write with the door open. When I was younger, I wrote with the kids on my knees practically. Now I need a little more concentration. But not so much. It doesn’t bother me if I’m interrupted. Sometimes it can fall at the wrong time, but I’m not one of those who disconnects the telephone. And if a friend calls me to go out for lunch and have a glass of wine, even better.